Aquatherm pipe was selected since it won’t corrode, scale or wear out and could be used on a variety of applications. "We felt it was, in the long run, the best way to go. We like it because of its ease of application and lighter weight; also, for most of our projects, we don’t have to insulate it. For our applications, it’s been easier to work with." PP-R’s lighter weight compared to steel, rust resistance, and flame-free connections were huge benefits. The design team liked that hard water doesn’t affect the piping, making it ideal for almost any application. Aquatherm piping systems are completely free of heavy metals and toxic chemicals and will not leach chemicals into the water. The design team was looking for a pipe that would work in many different applications and would last many years with little maintenance. Sometimes seeing really is believing. Southern Adventist University, a co-educational institution established by the Seventh-day Adventist Church in Collegedale, TN, has been renovating campus buildings and specifically retrofitting piping projects since 2011. Although the university was originally founded with 23 students in 1892 as Graysville Academy in Graysville, TN, it has grown considerably since, becoming the largest Seventh-day Adventist undergraduate establishment in the church’s North American division. By marketing its affordability, value, Christian professors and contemporaries, and the campus’ spiritual environment, the school registered a record 3,053 students in 2010. The university’s growth meant various school facilities needed to be renovated and expanded and a new structure had to be built. As part of the many improvements, several of the buildings’ piping systems required upgrades. When the administration began to focus on the modernizations, Dave Allemand, the university’s Associate Director of Plant Services—Building Systems Management, knew he would need to specify piping that could work for many types of projects. He tasked his lead plumber, Tim Mitchell, with researching piping options. Mitchell was introduced to Aquatherm polypropylene-random (PP-R) piping systems by David Ladd, an outside salesman with the Ferguson Enterprises, Chattanooga location. Ladd and Mike Nix, president and owner of Mike Nix and Associates, a manufacturer’s representative in Peachtree City, GA, provided Mitchell with extensive information about Aquatherm piping systems and the solutions they provide over other materials. Mitchell learned through his research that PP-R piping won’t corrode, scale, wear out or clog—even after years of use; hard water doesn’t affect the piping, making it ideal for almost any application. Additionally, Aquatherm piping systems are completely free of heavy metals and toxic chemicals; they also are hydrophobic, which means they will not leach chemicals into the water. Another issue eliminated by PP-R is electrolysis, which often occurs with metal piping systems. “I liked a lot of the possibilities of how it could work in our applications,” Mitchell said. • Talge Hall, originally built in 1961 as a women’s dormitory and now a men’s residence hall with 383 rooms, needed a new domestic-hot-water piping system as well as bathroom renovations on three floors. Mitchell and outside contractor Webb Plumbing, Heating and Electrical Corp. from Athens, TN, installed a 1.4-MMBtu Lochinvar® Copper Fin II® boiler and used 130 ft of 2½-in. Aquatherm SDR 7.4 Green Pipe® (the green pipe with the green stripe that denotes its ability to handle higher temperatures) to connect three 200-gal storage tanks. The boiler circulates 135˚F water to the first tank; the water then is routed to the other two tanks, diluted to 125˚ and sent to various distribution points. About 120 ft of 2½-in., 180 ft of 2-in., 260 ft of 1-in., 200 ft of ¾-in. and 100 ft of ½-in. Green Pipe was used for the bathroom improvements. Engineered specifically for hot-water use, Aquatherm’s Green Pipe® with multilayer faser (MF) improves impact resistance and reduces linear expansion and contraction by about 75% compared with other plastics. • Thatcher Hall, originally constructed in 1968 and currently a women’s residence hall with 257 rooms, also required a new domestic-hot-water piping system. Mitchell and outside contractor David Smith Plumbing from Ooltewah, TN, constructed a similar setup and again installed a 1.4-MMBtu Lochinvar Copper Fin II boiler using about 156 ft of 2½-in. Green Pipe with MF to service three 200-gal storage tanks. 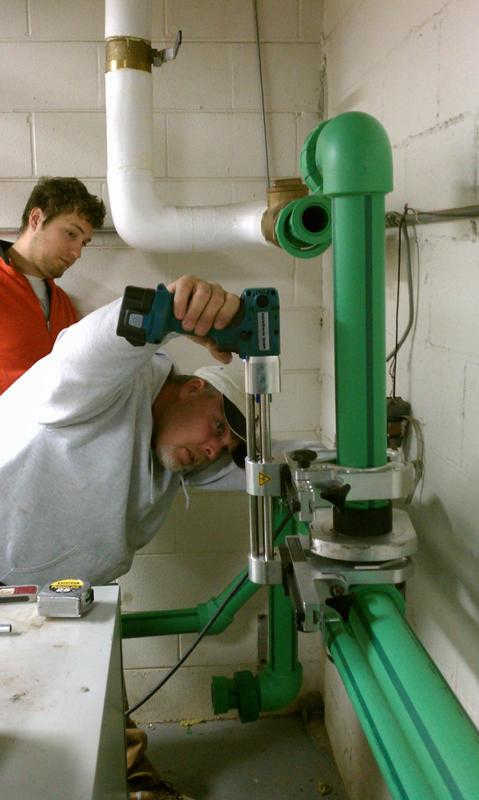 • Ledford Hall, which holds hands-on classes in its 10-bay auto-repair shop and drafting, graphics, welding, woodworking and lighting labs, needed new piping for an updated hydronic heating application. Mitchell created a hot loop for radiator-type heaters, running 150-168˚ water through 600 ft of 2-in. Green Pipe with MF at 50 psi. • The Hulsey Wellness Center opened its doors in 2008 as the university’s fitness facility. Even though the building was relatively new, two projects were necessary. 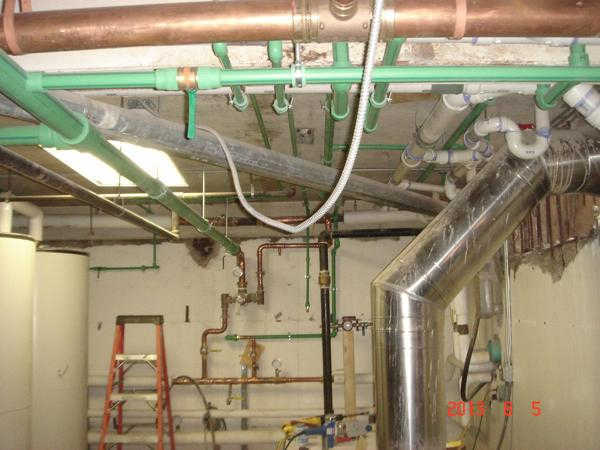 A large galvanized steel piping line running underneath the center already had ruptured a couple of times due to corrosion, and Mitchell wanted to replace it with another product rather than continue to commit to future costly repairs. Instead of digging up the concrete floor—another pricey solution—Mitchell hung 300 ft of 3-in. Green Pipe with MF from the ceiling in Walraven hangers for a domestic cold water line, 100 ft of which was suspended over an Olympic-sized swimming pool. The piping supplies the center’s locker rooms and bathrooms, which also were renovated. Mitchell used 250 ft of 2½-in., 250 ft of 1-in., 100 ft of ¾-in. and 150 ft of ½-in. Green Pipe with MF for the updates. 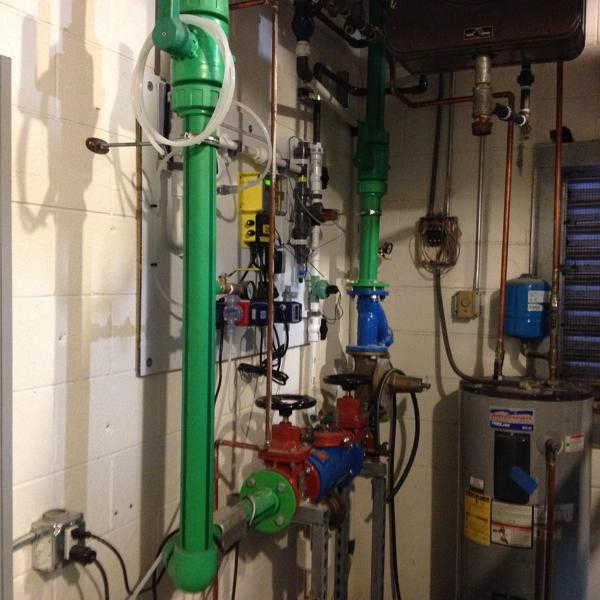 Although Mitchell could have used the less expensive Aquatherm non-MF Green Pipe SDR 11 (the green pipe with the blue stripe), which is designed for cold-water use, he preferred to use only one type of the piping for simplicity. The MF Green Pipe actually exceeds the requirements for cold-water applications. • Finally, the McKee Library, which originally opened in 1970, needed a new chiller and associated piping for an HVAC application. This project was especially unique. According to Mitchell, the outside contractor was unfamiliar with Aquatherm and preferred to use steel pipe when he installed the chiller on the outside of the building; it took him three months to complete the project. However, when it was time to install piping on the inside of the building, Allemand stepped in. First, he was concerned about the length of time the library would have to be shut down to weld the entire steel-piping system. Second, the library hosts an assortment of valuable materials and artifacts related to former President Abraham Lincoln and the Civil War, called the Thomas Memorial Collection, on the third floor; Allemand was worried about the risk of a fire starting when welding steel pipe so close to irreplaceable objects. “We would have had to shut down the library, vacate it and get burn permits,” Allemand said. Instead, Mitchell and outside contractor Industrial Air & Mechanical Contractors, with offices in East Ridge, TN, and Dalton, GA, ran 143 ft of 3-in., 78 ft of 1¼-in. and 52 ft of ¾-in. Blue Pipe from the steel boiler and chiller loops in the basement up to the four HVAC units on each of the three floors. Because Aquatherm PP-R piping is joined using a unique and quick heat-fusion welding process, both of Allemand’s problems were solved: No open flames were necessary, and the library’s downtime was minimized. Aquatherm uses reliable heat fusion to form connections; heat fusion bonds both sides of a joint into a single, homogenous material without the use of chemicals or mechanical connections, which eliminates systematic weaknesses and fail-points in the pipe. The seamless heat-fusion connections, combined with the piping’s resistance to corrosion and abrasion, help to ease leakage concerns. Although Nix originally trained Mitchell and a few other university staff members on the heat-fusion welding process, several outside contractors and their employees also have been educated as needed during various projects. A number of welding tools have been used as well, including Widos and McElroy fusion machines and, notably, the McElroy Spider 125™ with Universal Clamping. After seeing the many successes the university has had with Aquatherm over the years, Allemand has asked that the piping be specified in a new two-floor, 80,000-sq-ft Student Life Center. The center will feature the college’s main dining facilities, a small theater, study rooms and many areas for student associations and other activities. Groundbreaking is expected to commence in summer 2015. He believes Aquatherm is once again the right choice for the job. Even Nix was impressed with the university’s approval. “I do not know of another institution where Aquatherm is preferred by the facility maintenance department and where they insist Aquatherm is to be specified as the piping product in their future new-construction projects,” he said.